It's HERE! 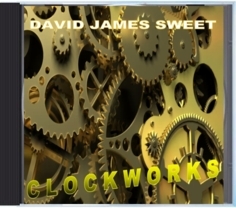 David James Sweet's new CD "CLOCKWORKS" is now available. You can order the CD or download the album digitally DIRECT from the manufacturer, KUNAKI. CD's are now also available from the artist directly. Click here for an MP3 sample of this work. After a fierce battle with FTP access, we're back! David is working on a new CD to be released this spring. The CD includes many tracks reclaimed from the scrap heap, as well as a few newly crafted jewels. More soon! Here are some pics of a recent photo session for the promotion of the new CD "Clockworks". The Anubis Spire CD "Between The Two Eternities" is now available at CD Baby! David recently attended the closing ceremonies of the Bob Moog exhibit at the History Center in Ithaca, NY. Anubis Spire's new CDBetween the Two Eternities is now Available. Click the link to go to our CD Baby page to check it out! Also, Anubis Spire's ERRATICA is still Available. Click the link to go to our CD Baby page to order now. And, as always, contact Mr. Sweet via E-Mail or on Facebook to request information on how to get a SIGNED copy! Mr. Sweet is also in his home studio working diligently on a new CD. As ususal, All CDs and other promotional materials are still avialable at the usual outlets. iTune sales and CD Baby sales are still going well. Be sure to check out these music outlets! David's latest CD entitled "Music For Relaxation, Meditation, and Massage" is available exclusively from EMRL. This is a retrospect CD of totally relaxing and flowing pieces, with previously released and unreleased material. It has much more of a "New Age" Ethereal feel, and tracks are skillfuly blended by constant soothing waves of ocean shoreline between tracks. A relaxing, meditative CD intended for the art of theraputic massage or meditation. The run time is a full 64 minutes of soothing and relaxing music. Contact us now by e-mail if you would like to purchase this wonderful CD now! David's CD "Then...and Now" is another retrospective collection of unreleased material from the vault. Spanning from 1986-2007, these works were origianlly recorded at Dave's home studio on a 4-track recording system, and stored on master cassettes for quite some time. Styles range from eclectic hard edge electronic rock, to soothing space music that sweeps you away. Vintage equipment is well noted on this CD. David has a page up on Soundclick.Com. Check it out for digital downloads available today! Interested in having Dave perform LIVE at a venue in the Upstate NY area? Just drop us a line!. Click your browser's back button to return to the main page.